In the seven weeks since the military-backed bloodless coup in Honduras, several hundred people protesting against the de facto government have been arbitrarily arrested and beaten by government forces, a new Amnesty International report says. The report, released Wednesday, said the beatings were meant to punish those who opposed the ouster of President Manuel Zelaya in June. It includes testimony from, and photographs of, several people who were baton-whipped and detained by police officers who sometimes wore no visible identification and hid their faces behind bandanas as they broke up demonstrations. “They beat us if we raised our heads; they beat us when they were getting us into the police cars,” said a student whom Amnesty International interviewed in late July at the police station where he was being detained. “They said, ‘Cry and we’ll stop. '” Multiple requests to the government for comment went unanswered. The government has said in the past that the demonstrators were arrested for engaging in violence and provoking authorities. The Honduran political crisis stems from Zelaya’s defiant push to hold a referendum that could have led to extending term limits by changing the constitution. The country’s congress had outlawed the vote and the supreme court had ruled it illegal. He was ousted in a coup on June 28. The congress named Roberto Micheletti provisional president shortly after the military detained Zelaya and sent him into exile. Micheletti and his supporters deny that a coup took place, calling the action a constitutional transfer of power. The coup resulted in unrest throughout the country, with frequent clashes between police and military on one side and civilian protesters on the other. At least two people were shot to death, Amnesty said. Among several examples, the Amnesty report quotes F.M., a 52-year-old teacher, who said he was demonstrating peacefully when police descended on the rally. “They grabbed me and shouted, ‘Why do you (all) support Zelaya’s government’ They beat me. I have not been informed as to why I am detained.” He showed deep-red imprints on his back, which he said were from a beating with a baton. 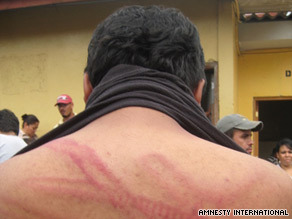 “Detention and ill treatment of protesters are being employed as a form of punishment for those openly opposing the de facto government and also as a deterrent for those contemplating taking to the streets to peacefully show their discontent with the political turmoil the country is experiencing,” said Esther Major, Amnesty’s Central America researcher.